Amazon.com description: Product Description: In their youth, Florentino Ariza and Fermina Daza fall passionately in love. When Fermina eventually chooses to marry a wealthy, well-born doctor, Florentino is devastated, but he is a romantic. As he rises in his business career he whiles away the years in 622 affairs--yet he reserves his heart for Fermina. Her husband dies at last, and Florentino purposefully attends the funeral. Fifty years, nine months, and four days after he first declared his love for Fermina, he will do so again. 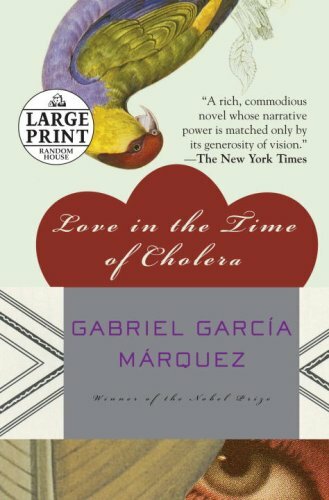 With humorous sagacity and consummate craft, GarcÃ­a MÃ¡rquez traces an exceptional half-century story of unrequited love. Though it seems never to be conveniently contained, love flows through the novel in many wonderful guises--joyful, melancholy, enriching, ever surprising.